The preheater is a very important component in the lime kiln equipment. Its main function is to recover the high temperature exhaust gas generated during the calcination process and to preheat the raw material, thereby more effectively improving the calcination efficiency of the activated lime kiln. Saving resources, however, during the use of the active lime kiln preheater, sometimes the phenomenon of blockage of the preheating system will occur. 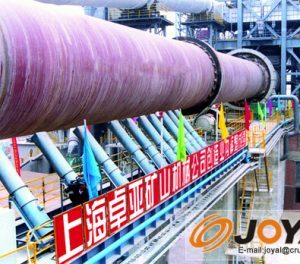 Shanghai Joyal Mining Machinery here is talking about the problem of blockage of the lime kiln preheater. Joyal reminded the users that it is necessary to take measures such as stopping materials and coal immediately after we find that the lime kiln preheating system is blocked. At the same time, we must carry out the treatment of slow brick kiln to reduce the content of materials in the kiln. Lime kiln is a relatively large equipment that requires careful attention from the user. Then determine the blockage of the lime kiln preheating system and develop a reasonable cleaning plan. If the preheating system is blocked slightly, the coal volume can be appropriately reduced and the active lime kiln can continue to operate in the case of a little clogging. If the preheating system is blocked more seriously, it is necessary to stop the material and coal while slowing down the speed of the kiln. When we are clogging the lime kiln preheating system, we can use an ultra-high compressed air lance or water cannon to align directly with the blockage of the preheater. It should be noted here that when the active lime kiln preheating system is plugged, the principle of “first down and then up” should be adhered to, that is, the lower part and the upper part of the back part are first to ensure that the material under the arm can be smoothly discharged. Previous: Venezuela re-transmits the news, Joyal basalt crushing production line shinesNext: How much is the price of the 1000 mesh wollastonite mill?